Perhaps the most rarely seen sulfide, in geodized brachiopods from Georgetown, is Sphalerite. Although approximately one third of geodized brachiopods will have Pyrite, Marcasite or Goethite, less than 1 in 100 will house Sphalerite. Sphalerite, at this locality, tends to form small dark reddish brown to black crystal groups and masses. This mineral will form smaller individual crystals, although this is not the norm for the species, at this locality. Although some crystals may have a slight iridescent coating, most of the Sphalerite at this locality shows little or no corrosion or alteration. Due to the typically small cavity size of geodized brachiopods and the low percentage of Brachiopods with this mineral, preserving an undamaged Sphalerite crystal can be difficult. 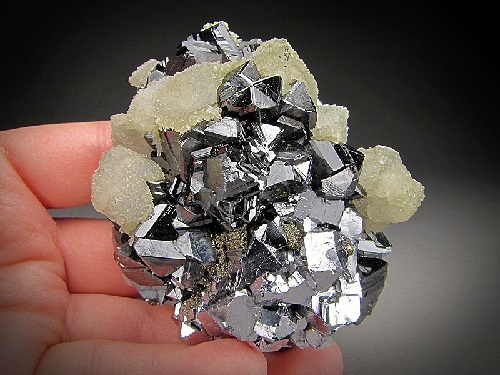 Sphalerite, when present, will generally more than half fill the cavity. The photo to the left is an unusually fine example of Sphalerite from this locality. This crystal is far smaller than the average Sphalerite crystal group from Georgetown. Smaller crystal groups, like this one, typically have better color and make better specimens than large groups which generally can not be trimmed. Also, while this crystal appears to have sharp crystal faces, most of the larger Sphalerite crystals encountered at the Georgetown road cuts are more crude and generally darker in color. Although Georgetown, Ohio is relatively near the Serpent Mound Zinc Disturbance, the Sphalerite at this locality is most likely unrelated. Although outcrops and stream beds in the vicinity of Georgetown are littered with the highly fossilliforous Ordovician age shale-like limestone, road cuts will have the highest potential for unweathered geodized brachiopods. Stream beds and outcrops, in this area, may have geodized brachiopods, but many of the accessory minerals will have deteriorated. On the map to the right, 4 road cut localities are pinpointed which have produced geodized brachiopods. Site number one is a long high road cut on both sides State Route 125 West of White Oak Creek. Most of the specimens used in this article came from site number 1. Site number 2 is a long high road cut on the North side of State Route 125 East of White Oak Creek. Since these two road cuts were excavated in the same year, specimens found at this locality will be of equal quality. Site number 3 is a short sloped road cut on both sides of State Route 125, a few hundred yards North of Straight Creek. Geodized brachiopods are found near the top of this cut. Site number 4 is a short shallow road cut on U.S. Highway 68 South of the intersection with State Route 125. Geodized brachiopods are more infrequent at this locality, but, in general, the average cavity size is larger. Although sites number 1 and number 2 have produced all of the mineral species listed above, sites number 3 and 4 have not been as well researched and may or may not produce all of the above mineral species. Other road cuts around Georgetown and throughout Brown County may also produce similar mineral specimens. The locality photos of each of the four sites were taken in the fall of 2003. Many of the specimens which were photographed for this article were collected during this same year. The direction attributed to each site number indicates the viewpoint of the camera. Previous Post Previous post: Diamond Clarity – What and Why It Matters?